» Forum » The Lounge » Generally off-topic » Can anyone assist with an IT ? » Can anyone assist with an IT ? Can anyone assist with an IT ? I am hoping that someone out here can asssit with an IT question. What I want to be able to do is to simply add more wired Ethernet lines to my existing network which is pictured below. I thought just adding a switch would do it but I was wrong. The existing works just fine as it is with the exception of the Apple TV which does not work due to a WiFi being plugged into a WiFi I think. When I currently use the Apple I just temporarily will use the Xbox deed and then out it back to the way it was. I currently have an unmanaged Netgear 8 port switch that I thought I could insert between the modem and the wrt1200 for the additional nodes but it does not work. You're close -- plug the Netgear 8 port switch into the Linksys WRT1200AC and you'll get more ports. That will give you 7 more ports to use. You don't really want two WiFi devices on your network -- if you do need more coverage in your house, you want what's called a "mesh" network. Look at Netgear Orbi or Ubiquiti (those are the two I have experience with and they work great, but there are others). The Linksys EA600 needs to be put into bridge mode. If the router has that specific setting, it should work. If that setting isn't shown, you should turn of DHCP. The EA600 is going to try and assign IP addresses, which will conflict with the other router. There are other reasons why your existing hardware isn't optimal. Two much better options are: a) not hardwiring the apple tv or b) purchasing Google Mesh or a similar mesh router setup. These new mesh setups solve for the absurd technical hurdles that have plagued home routers forever. You can hardwire the mesh pucks or use them wirelessly and the configuration is managed via phone. Thank you fezmid and frogman. I am very grateful. I understand about the two wifi’s Not the best situation but it does work at the moment save for the Apple TV. That is one reason I am adding another node is to plug in the Apple. Orrwctly and not through the second WiFi box down stream. And that will provide for the additional nodes. Sounds great and exactly what I need. There is a “Ethernet” port on the back of the wrt1200 and then four what I will call slave ports. I assume the Netgear switch will go into one of those additional ports correct? Correct - the cable modem will plug into the single port, and the other four ports are Ethernet ports -- plug the switch into one of those ports, and it'll look like one big network. Also, make sure your the cable going from your Router to the Linksys EA6100 is going into the LAN port on the 6100 and not the WAN port. Otherwise, the 6100 will act as a router, and not a switch, and you will have two subnets, which I don't think you want. You can plug the netgear switch into either linksys devices, just make sure nothing is plugged into the 6100 WAN port. The cable from the wrt1200 is going from one of the four ports on the wrt1200 to the Ethernet port on the ea6100. ....and just to be clear, get ALL your stationary devices off of WiFi. Make sure your TVs, your Xboxes, your Stereo Receivers, your Desktop PCs...everything that can be hardwired IS hardwired. If you get a managed switch, you can even give your Xbox priority; for lag free gaming. Terrible recommendation... If you do that, then who do you blame when you lose the game? You'd have to take personal responsibility instead of blaming the hardware! This is 100% correct. Currently you have two DHCP servers on your network which will cause problems. Either the EA6000 needs to go or be put in bridge mode. 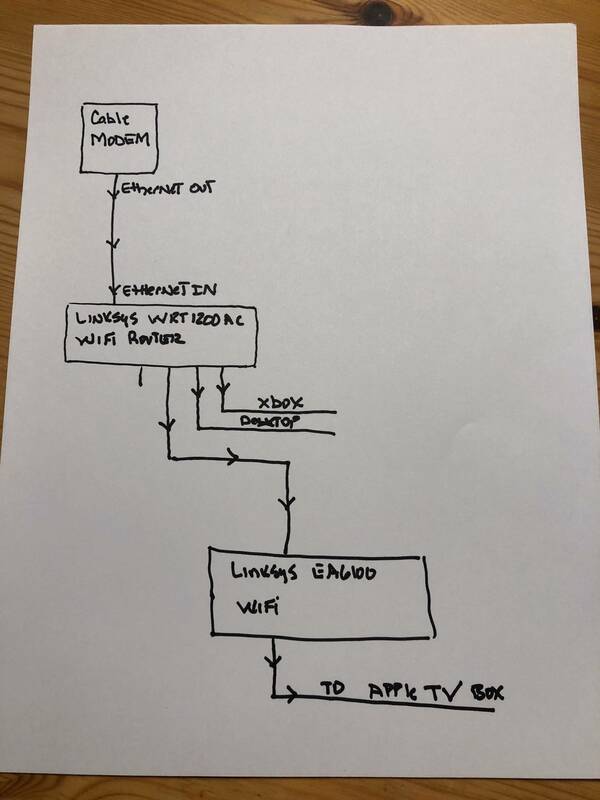 You setup will work but the AppleTV is behind a double NAT right now and is going to have issues communicating with other devices on your network. Chances are they are on the same addressable range so inevitably you’re going to run into an IP address conflict. Easiest solution is to pick up a cheap switch and swap out the EA6000. Something like this would work just fine. Single cable from modem to Internet port on router, single cable from router to switch and all wired devices plugged into the switch. You either need the EA6100 on bridge mode (DHCP Off & a static IP for the device) or you need to swap it out with a switch. Any reason you want to keep the EA6100 and not replace it with a switch? Using a router as a switch isn’t the best idea. What I did was move and wire in a feed to my Wifi Router to a central location (dead center) in my home and then a “back feed” cat5 run to my switch where everything is hardwired to. It worked perfect and removes the need for anymore wireless devices adding to the network. I work in telecommunications so this may seem easy for me, the other 96% its a tough one.